Boice. R. (2000). 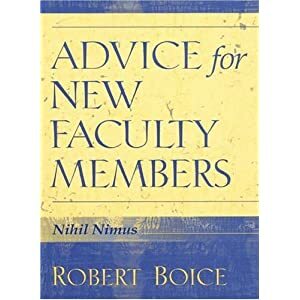 Advice for new faculty members: Nihil nimus. Boston: Allyn & Bacon. Revised version; first published in the University of Ottawa’s Centre for University Teaching newsletter, Teaching Options pédagogiques, Vol. 9 No. 1, June 2004. Remember what it was like taking your first teaching job right out of graduate school? Perhaps it was decades ago, perhaps just a few years ago, or perhaps you are making that transition right now. Robert Boice has made a life’s work of studying the experiences of new faculty members, and of academic culture in general. The summary of his findings, experiences, and advice can be found in this book, expressed in a thoughtful and conversational style. Boice notes that the magnitude of the transition from graduate student to professor is “far larger than most new faculty anticipate. Indeed, it may surpass the transition from living with your family and near life-long friends to independent life at college.” (p. 225). He goes on to point out that this phenomenon is not limited to young new faculty members: professionals arriving on campus after a successful career outside academia face an even more daunting transition. How then does one survive? Boice’s mantra is nihil nimus – nothing in excess. According to his research of exemplary new faculty, moderate and consistent work will surpass constant busyness and late night work binges every time. He offers invaluable, research-based advice for planning and organizing the early years of your career, and then provides exercises to guide your planning for the three major tasks of your academic career: teaching, writing and social integration into the department and university. 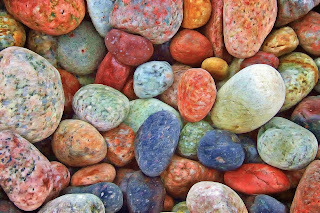 For teaching, Boice found that one of the most reliable predictors of faculty success or failure over the long term was what he calls classroom incivilities. These include students talking so loudly that other students cannot hear what is going on in class, students who interrupt a lecture with sarcastic comments or disapproving groans, or a classroom provocateur whose “unpredictable and highly emotional outbursts…make the entire class tense.” (pp. 85-86) In his study of new faculty at colleges and universities, “classroom incivilities dominated many classrooms, and its presence or absence in first classes proved a strong predictor of how teaching careers would proceed, even of how likely new faculty would thrive in the reappointment process.” (p. 82) The trigger points for many of these scenarios turn out to be the first days of class, before and after the first and second exams, and near the deadlines for major projects. Boice gives new faculty members sound advice on how to understand and mitigate these events, which can be so corrosive of students’ and teachers’ experience of a course. This may come off as a bit of Zen for profs, but he backs up his claims with solid research and practical advice on how to realize the benefits of this approach. Boice’s final subject is the socialization of new faculty members in their department and the university. This process can be tricky, and he takes pains to be frank about academic culture and to describe how successful new faculty members negotiate this potential minefield. Unstated expectations, diverse personalities, and stress over retention, promotion and tenure processes can take a toll. Boice again offers advice gleaned from observing exemplary faculty members, and provides useful exercises and tasks to help new faculty members learn about their department, build relationships with colleagues both within and without the department, and find effective mentors and nurture them. His research found that successful mentoring resulted in a new faculty member always coming close to department expectations for scholarly productivity, always exceeding departmental expectations for adequate teaching, and always rated by reappointment committees as adequately collegial and cooperative. When someone on my professional listserv once asked for recommended books to give to new faculty, Judith Miller from Worcester Polytechnic Institute in Massachusetts replied that her center has offered this book to new faculty members for several years. Many of the WPI faculty members described Boice’s book as “transformative.” Perhaps you are one of the three to five percent of Boice’s new faculty members who are exemplary role models, and for you this book will simply confirm what you already suspect is true. But for most of you who are new faculty, and for those educational developers who work with new faculty colleagues, I predict that this book will prove to be full of useful and sage counsel.